Most of my backpacking has been in the mountains of Colorado and the deserts in the southwestern US. I�ve gone winter camping several times, but I still prefer backpacking in the warmer months. Most of my trips are 2-3 days, but I have taken several trips of 5-6 days. In the summer of 2004, I was fortunate enough to have thru-hiked the 476 mile Colorado Trail over 35 days. Recently, I have been leaning towards the lightweight side of the spectrum. The Brooks-Range Mountaineering Equipment Sharktooth Mini Pro Shovel is designed for demanding backcountry use in winter environments. It is composed of four distinct components: a blade, two shaft sections (which double as stretcher bars for a backcountry rescue sled) and a handle. The blade measures 9 in by 10 in (23 cm by 25 cm) and features a serrated leading edge. According to the manufacturer, this edge makes "short work of the toughest stubborn ice and hard pack. Only available on Brooks-Range shovels." I have to admit, it is quite sharp. Painted on the surface of the blade is a 5-step quick reference guide to avalanche beacon search patterns and companion rescue. It's a feature I haven't seen on shovels before. Ideally, all backcountry travelers should be well-versed in avalanche rescue skills, but having a handy cheat sheet provides an extra margin of security. 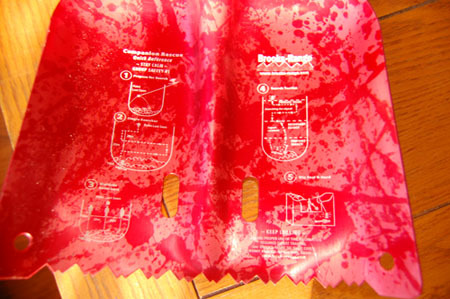 The blade also features four holes so it can be used as an emergency deadman anchor. It also has two 1.25 in by .5 in (3 x 1 cm) oval holes. I can't figure out what these are intended to be, as they don't seem to appear on the shovels pictured on the website. I'm thinking they may be intended to reduce weight of the shovel, as they shouldn't affect the structural integrity at all. Where the blade connects to the shaft, my shovel has been personalized with my name. This optional personalization is available if purchased from Brooks-Range Mountaineering Equipment directly and costs $10 US extra. There is a box to select personalization or no personalization on the Brooks-Range website. Basically, the customer can have a name painted on the shovel in the same paint that the avalanche beacon search pattern is printed with. The blade section connects to the lower shaft section with two detent buttons. The upper shaft section connects to the middle shaft section with one detent button. The upper section can be locked into a packed or extended position. The plastic, D-shaped handle connects to the upper shaft section with one detent button. In its packed position, the shovel (from serrated edge to handle) measures 35 in (89 cm). In its extended position, the shovel measures 44 in (112 cm). 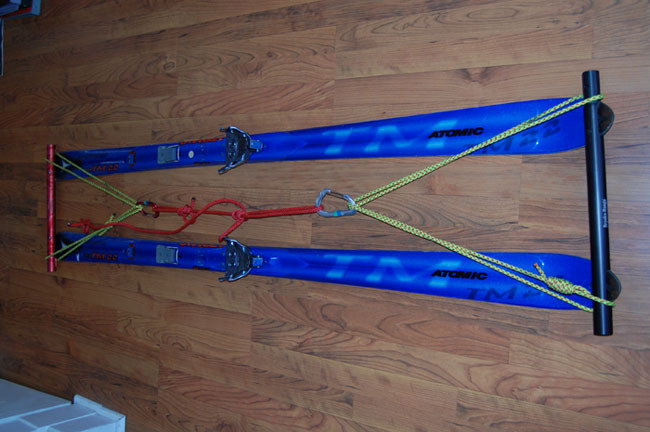 As I mentioned earlier, the two shaft sections can be used as stretcher bars for an emergency backcountry sled. 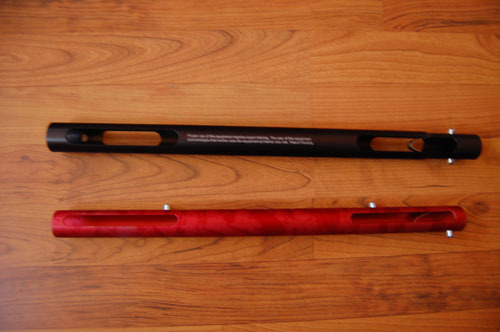 The lower shaft section (and front stretcher bar) is 18.25 in (46 cm) in length and has two oval cutouts on each side of the bar. The cutouts on one side are 4.5 in by .6 in (11 cm by 1.5 cm). The cutouts on the opposite side are 2.5 in by .6 in (6 cm by 1.5 cm). The upper shaft section (and back stretcher bar) is 17 in (43 cm) long. It has two oval cutouts on one side of the bar. Both of these cutouts measure 4.5 in by .6 in (11 cm by 1.5 cm). Maybe I'm being a little melodramatic, but I think this is a beautiful shovel. Not only does it appear to be crafted quite well, the Chaos Red color is a wonderful change from the boring color patterns that are common on most pieces of gear like this. The shovel components all lock together quite solidly. I've found that the handle seems to be the most difficult part to attach. The detent buttons don't pop into place as easily as they do on the metal sections. It only takes me an extra second or two to lock it in, but I plan on leaving the handle attached while stored in my pack, as every second counts in an avalanche situation. The stretcher slots in the shaft sections can make it interesting when changing the shovel from the packed position to the extended position. In order to avoid the button popping out in the slots, one has to twist the shaft sections until the detent button is past the slots, they twist it back in line with the locking hole. It's actually pretty easy to do, but again, every second counts. I really like the quick reference guide on the shovel blade. While I feel comfortable in my avalanche rescue skills, it's nice to know that, should I panic in an emergency, I have instructions to help me regain my bearings. I am a little concerned that the paint of the quick reference guide and my name will scratch off. I've already found a few spots on the blade where paint is starting to wear, although the search instructions seems to be intact. I've tried scratching the search pattern paint with my fingernail, but it has resisted scratching so far. I'm interested to see what it will look like after four months of use. I'm also interested to see what the serrated edge does to the inside of my pack. My winter pack has a separate compartment for a shovel and probe, and I always store my avalanche safety gear inside my pack. It will be interesting to see if the serrated edge damages the inner material. I typically remove the blade from the shaft when packing my shovel. This shovel shaft extends a little further than my old shovel, even when in its packed position. The pocket still closes, but pushes on the pack lid a bit. I'll have to pay attention to how the shaft works when my pack has more equipment in it. My testing has taken place in the Elk Range of Western Colorado. I have used the shovel at elevations ranging from 7000 ft (2100 m) to 11000 ft (3400 m). Temperatures during testing were quite cold and ranged from -10� F (-23� C) to 10� F (-12� C). Snow conditions have ranged from fresh powder snow to extremely hard packed snow. I've taken the Brooks-Range Sharktooth Mini Pro Shovel on three backcountry ski trips, one igloo-building trip, and have also used it to dig out a car one other time. Winter took its time getting here, but the mountains are now inundated with snow. On the three backcountry ski trips that the shovel accompanied me, it saw little use. On each trip I dug a quick snowpit to assess snowpack stability. The snow during each of these uses was very light and unconsolidated. The shovel had no trouble whatsoever cutting through the snowpack. I was impressed how efficient the shovel was at moving snow, especially given the size of the blade. I was able to quickly move snow out of the snowpit area and down the slope. The extendable shaft made this even easier. I do wish that the shaft would collapse down just a little further. Like I stated in the initial report, I have some difficulty stowing the shaft and handle section in my pack. I've found that this is even more difficult when my pack is filled with my normal backcountry ski gear. I was able to get the zippers closed, but it took a fair amount of effort and adjusting. I'm hoping to find a better solution soon. After my last trip with the shovel, it sat in the back of my car for two days in very cold temperatures. When I took it out, several of the adjustment push-buttons were frozen in place. I eventually had to use my ski pole tip to break them free. Once they were operational, I discovered that the shaft had frozen in the collapsed position. After a significant amount of pulling and twisting, I was able to get it free. This concerns me, as every second counts in an avalanche scenario. On the igloo-building trip I used the Sharktooth Mini Pro Shovel to fill an ICEBOX Igloo Tool form with snow. Before long, a layer of snow had frozen to the blade. It wasn't a significant amount of snow, and it was actually beneficial. Most of the snow I was shoveling was either powder or depth hoar. The snow on the blade had frozen over the holes, preventing the loose snow from falling through the shovel. Every so often, the amount of snow frozen to the blade would reach a volume that I felt was too great. I would turn the blade upside down, smack the bottom with my hand, and most of the frozen snow would fall off. During the three hours I spent working on the igloo, I had to do this approximately four times. This frozen snow did bother me when it was time to pack up and go home. I wasn't able to scrape all of the snow off of the blade, so I had to strap the shovel to the outside of my pack. This may be acceptable in safe terrain, but I would never do this in avalanche-prone terrain. I also noticed that some of the adjustment push-buttons were beginning to freeze up by the end of my igloo-building trip. I was still able to shorten the shovel, but the buttons connecting the blade to the shaft where frozen and required a jab from my ski pole tip to free them. The other time I've used the shovel was to dig out the car of a friend who had gotten stuck. After we dug past an 8 in (20 cm) layer of loose snow, we had to dig through a 5 in (13 cm) layer of extremely hardpacked snow. This is when the Sharktooth Mini Pro really shined. I was amazed at how well the teeth on the blade bit into and dug through the hardpacked snow. I feel like I could remove snow faster than my friends who had traditional shovels. The extendable shaft was especially nice in this situation. It allowed me to get much more leverage under the snow and pry up larger chunks. Underneath this hardpack snow were some rocks. I hit several as I was digging, and these resulted in some minor damage to the underside of the shovel. 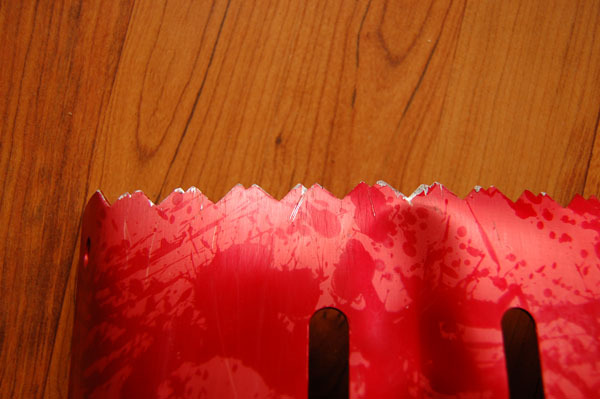 These included several scratches and a few worn-down teeth on the underside of the blade. I will continue to monitor this damage and see if the shovel experiences any more. As a final note, the shovel initially came with a length of reinforced spray hose with a slit running down one side. This serves as a protector to fit over the serrated teeth of the blade. This protector was so difficult to put on, I decided to forgo it. Last week I received an envelop from Brooks-Range Mountaineering Equipment. Enclosed was piece of black plastic; it is the new and improved blade protector. 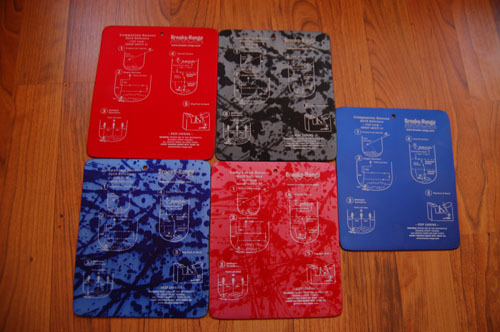 This protector easily slides into place and covers all the the teeth easily. 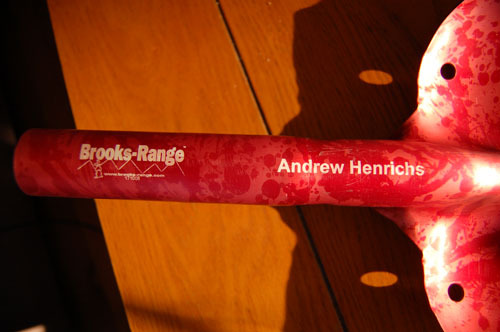 I thought that was a very nice touch from Brooks-Range. Testing during the Long Term Report phase has taken place in the Sawatch and Front Ranges of central Colorado. I have used the shovel at elevations ranging from 9000 ft (2700 m) to 13000 ft (4000 m). Temperatures ranged from -10� F (-23� C) to 35� F (2� C). Snow conditions have ranged from fresh powder snow to extremely hard packed snow to sun-warmed dense snow. 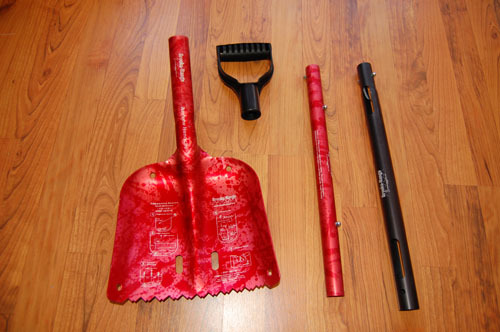 Over the last two months, I have used the Sharktooth Mini Pro shovel while attempting to build three igloos as well as six backcountry ski trips. On my subsequent igloo-building trips, I have become convinced that the shovel blade was not meant for such a task, particularly when I was trying to build an igloo alone. The blade is just a little too small, which decreases my efficiency when shoveling snow into the igloo-building mold. This was particularly apparent when I was moving around sugary snow; it seemed to pour right off the sides of my shovel. This wasn't as apparent when shoveling either powder snow or more dense snow. The extendable shaft was a back saver when building an igloo. Having this extra reach helped to offset the efficiency lost by the smaller blade size. It helped to increase the speed and decrease the energy expended while moving snow around. I continued to use the shovel to dig snowpits on all of my backcountry ski trips. It continued to cut through any and all snow layers with ease. The Colorado snowpack does not consolidate much until the spring, so I was never confronted with an extremely hard layer. I found the blade size adequate for digging a snowpit. This was usually a more quick-and-dirty task than building an igloo. As a result, I could quickly toss snow down the slope or push it out of the way. Again, the extendable shaft made it much easier to efficiently move snow out of my pit area. Since I (fortunately) never had to construct an emergency rescue sled in the backcountry, I threw one together this afternoon to illustrate how the shaft sections function as stabilizing bars. While it was definitely a bare-bones sled, I was very impressed at how much lateral stability the shaft sections provided. I could pick up one ski, and the entire sled moved as one unit; I couldn't detect any shifting at all. I continued to have issues with the blade icing up during both igloo building and snowpit digging. 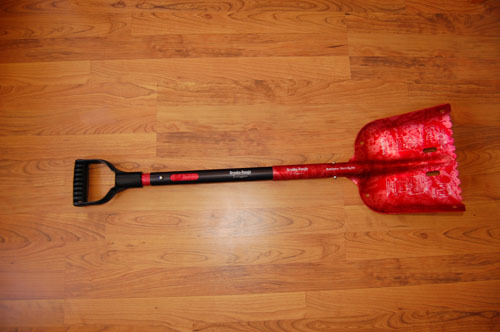 Interestingly, I had snow stick to my shovel both because it had frozen and because it was warming. Like I mentioned in my Field Report, a sharp blow to the bottom of the shovel typically knocked the snow loose. While I continued to have occasional issues with the push-buttons of the shaft freezing up, I've found that a jab with the tip of my ski pole is a quick and easy fix. As a result, this became less of a bother for me. The blade damage that I mentioned in my Field Report has not worsened at all. I will attribute this to the fact that the snowpack is much deeper than it was during the Field Report phase. As a result, I simply haven't dug deep enough to hit and more rocks. The quick reference guide on the blade is still completely intact and readable, as is the name personalization. My biggest complaint is that the shovel shaft does not collapse further. As I've mentioned previously, it is a struggle to get the shovel into my pack at times. The most significant change that could be made is to craft the shovel so one section of the shaft could be left home. While this eliminates its usefulness as an emergency stretcher, it would be a fantastic change. Most of my time in the backcountry is spent on long, mellow ski tours. I try to keep weight at a minimum and rarely expose myself to avalanche slopes or other potential dangers. The biggest danger on these tours is that I'm unable to make it back to my car and I must dig a snow cave. This shovel is probably overkill for such a tour. While I have no doubt that this shovel can dig through avalanche debris quite well, it is quite heavy for days when one will not encounter an avalanche. Thank you to Brooks-Range Mountaineering Equipment and BackpackGearTest.org for giving me the opportunity to test this shovel.